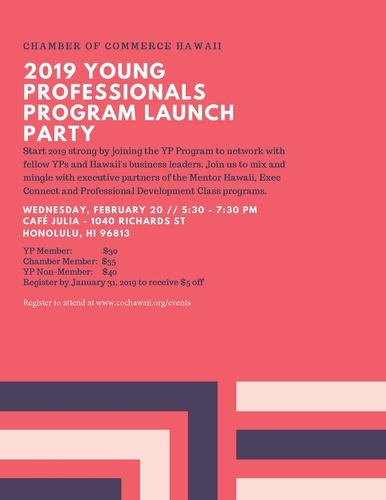 Start 2019 strong by joining the YP Program to network with fellow YPs and Hawaii's business leaders. Join us to mix and mingle with our executive partners of the Mentor Hawaii, Exec Connect and Professional Development Class programs. Take advantage of this great opportunity to network with other young professionals and business leaders. Executives Include - More to Come! Caroline Witherspoon, President - Becker Communications, Inc.
Kenneth M. Gilbert, Senior Consultant/Partner - Business Consulting Resources, Inc. Admission includes heavy pupus and 1 free drink.